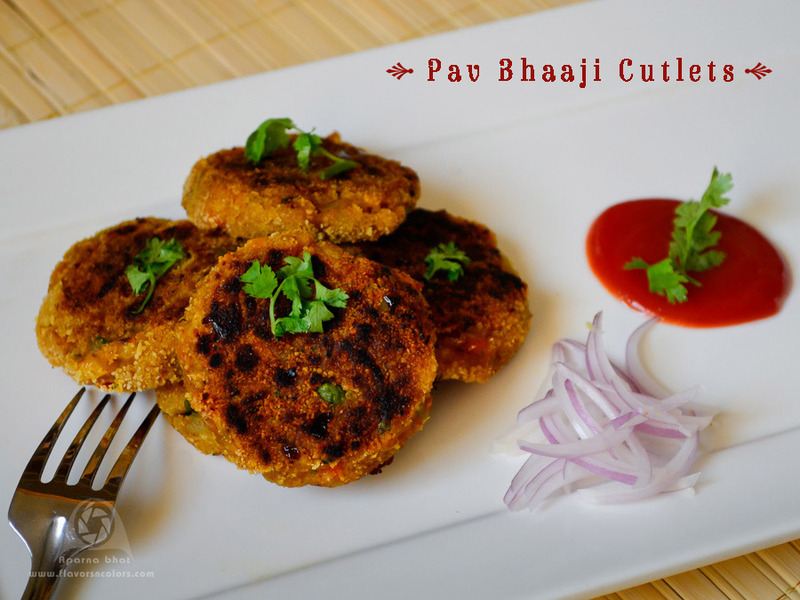 Surprise your family members and guests with this interesting and innovative cutlet recipe made from pav bhaji. Yes, pav bhaaji! The dish is prepared with a little twist to the traditionally served pav bhaaji. It was one of the times when I had prepared pav bhaji and my elder one wished to take it in his lunchbox. Usually I avoid packing foods that may be messy to eat in school and hence I didn't prefer to send the bhaaji in its original form. But then an idea hit me, why not make cutlets and send it with him as most of the cutlets are pototo based and contains different mix of vegetables. I googled to find if anybody else has tried this and yes there was a member at Tarla Dalal's site mentioning about her experiment. I went ahead to make them with already prepared bhaaji, stuffed it between pav and this served as a great grab and go, non-messy, wholesome and filling snack for the tiffin. Next time, I prepared the bhaaji with sole intention of making these yummy cutlets. Shallow frying made it much more healthy and I served them as tea time snack. Was happy to see everyone at home had polished off their plates in no time. Do try the below recipe and share your experience! 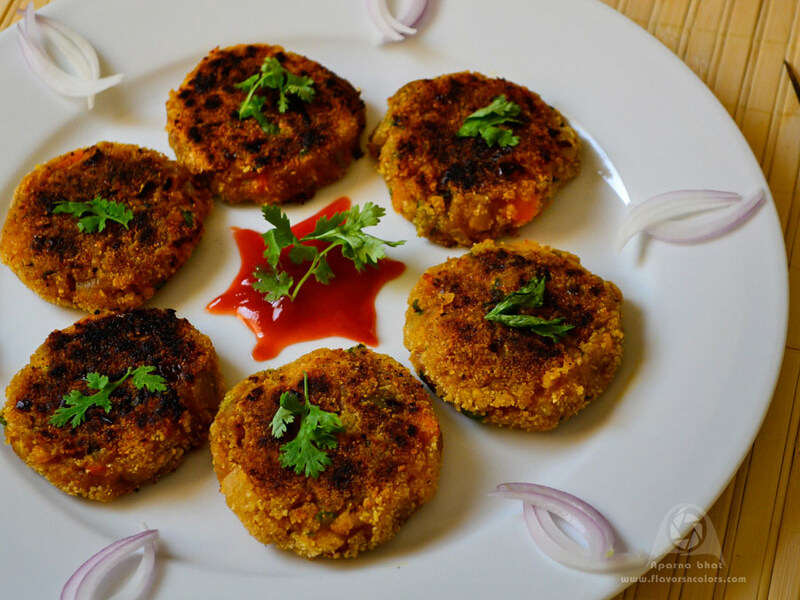 You can follow your own recipe for bhaaji, just avoid adding water to it and make these cutlets as mentioned below. Heat the butter in a pan. Add chopped onion, grated garlic ginger and saute them till the raw smell disappears. Add chopped tomatoes, chopped capsicum, red chili powder, turmeric powder and fry them till capsicum and tomatoes turn soft. Next add blanched cauliflower, green peas, boiled and mashed potatoes. Mix it well. Sprinkle pav bhaaji masala powder, garam masala powder, amchur powder and crushed kasuri methi powder, salt as per taste and finely chopped coriander leaves. You can alter the spices to suite your taste. Remember not to add water throughout, cook on low flame for 5 minutes, and later switch off the flame. Divide the bhaaji in equal portions. Take a portion of the mixture, make round ball and flatten them between your palms as seen in collage pic below. Now coat them in bread crumbs and shallow fry [5-6 cutlets at a time] till they turn crispy and golden brown on both sides. Serve them hot with dip or salad on side. You can stuff them as patties topped with onion, tomato, cheese slices and use them in sandwich/burgers. Linking this post to C'mon chefs - cook up some starters event.